Rigal RD-805B Projector– A good choice for home cinema entertainment! This High-definition LED Projector is specially designed for Home Theater, Entertainment, Business Conference, Education Training, etc. Its physical resolution is up to 800 * 480 Pixels and supports maximum resolution is up to 1920 * 1080. Supporting a variety of Video, Pictures and Music formats. 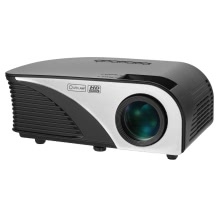 And, its 1200 lumens and 1500:1 Contrast Ratio for high-definition and bright images. It will bring you munch convenient and unexpected experience whether in your daily life & in your work. Adopt 4"Single Panel LCD Technology, RGB LED Lamps with More Than 50000 hours of lifespan, and features 1200 Lumens and 800 * 4800 (WVGA) resolution, supporting up to 1920 * 1080 (for a 1080P video-allowing you to watch your favorite movies in high definition). Offer 30 ~ 100 inches image size and 1.0m ~ 3.5m Projection Distance (Only can adjust the size of image by change the distance). Giving you a clear frame and a projection size of up to 100 inches, Aspect Ratio 16:9 and compatible with 4:3, meeting your different demands and offering better Use Experience. Support keystone correction (±15° manual), easily correct the trapezoidal distortion and get a best viewing experience at any angle. Adjust the lens with image focus button to focus image and get a super clear effect. Support HD Input / VGA IN / AV IN / USB IN /OUT / SD Card Slot (up to 64G) / 3.5mm Audio Jack, you can connect with your Notebook, Laptop, PC, DVD, Flash Drive/ HDD or TV Set Top Box (STB). And the included 5V Output USB port for charging Smartphone, Tablet PC. Equipped with Built-in speakers (2W 4Ω), enjoy audio from your videos or use the included 3.5mm headphone jack to connect external speakers or earphones of your choice. Adopt light and compact portable design, owns small size (21.0 * 14.5 * 8.0cm). Fit an entire home entertainment system in the palm-size Projector. You can easily carry it with you, conveniently watching all your favorite movies or making an impressive business presentation any time and anywhere. OSD Menu Languages: English, Chinese, French, German, Russian, and Portuguese. LED Lamp Using Life: More than 50000 hours. Amazing LCD true color display technology. Native Resolution: 800 * 480 Pixels. Support Resolution: Up to 1920 * 1080 Pixels (by HDMI). Aspect Ratio: 16:9 / 4:3. Picture Zoom: Manual Focus (Manual Zoom). Video Formats: MP4, RMVB, MKV, FLV, etc. Output Port: 3.5mm audio port / USB Out.